The EU stands for European Union. The EU is a unified trade system and has 28 member countries. It allows for the free flow of goods and people. The members of the EU are Austria, Italy, Belgium, Latvia, Bulgaria, Lithuania, Croatia, Luxembourg, Cyprus, Malta, Czechia, Netherlands, Denmark, Poland, Estonia, Portugal, Finland, Romania, France, Slovakia, Germany, Slovenia, Greece, Spain, Hungary, Sweden, Ireland, and United Kingdom. The government is run by three bodies. The EU council runs the national government. Parliament is elected by the people. The European Commission is the EU staff. All of the bodies make sure all members act consistently in regional, agricultural, and social policies. European Union uses the Euro as its currency. The UK stands for the United Kingdom. The United Kingdom is a state made up of the historic countries of England, Wales, and Scotland, as well as Northern Ireland. It is known as the home of both modern parliamentary democracy and the Industrial Revolution. The United Kingdom uses the pound as its currency. 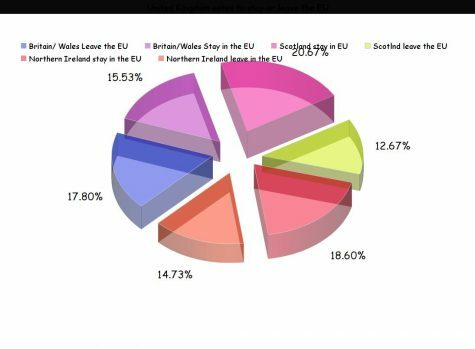 The chart above breaks down the percentage of each country’s vote to leave the EU. A referendum vote took place on June 23, 2016. The vote asked citizens to decide if they wanted to leave or remain in the EU. The results came in with 51.9% wanting to leave and 48.1% wanting to stay. The appealing part of the EU was that it made it easier for European countries to share in one another’s prosperity. In a union, cooperation means weathering downturns together and that hasn’t always been so easy. Seeing the EU in such a crisis made some have second thoughts about being in the EU and increased worry among wealthy countries that they might have to help bail out less wealthy countries down the line. The second reason is some of Britain citizens did not like so many foreigners moving to Britain when they joined the EU. When the EU was established they made a law saying no borders and that any EU citizen could move where they like. The EU expanded to include post-communist countries in the mid-2000s, and people in those countries were poorer. Many of their citizens immigrated to wealthier countries — like the United Kingdom so they feel like they can take care of their family and get great jobs. In 2008 the market crashed and was hitting some EU really hard. Which made it hard to find a job. Citizens in their own countries could not find jobs so they moved into the more wealthier parts of the EU. What are the possible results of the UK withdrawing from the EU? A person living in the UK breaks the bridge that connects to the EU. Norway. The EU is also currently in the process of tightening rules on third country access to financial services through the Markets in Financial Instruments Directive. Another UK consideration is the financial passport whereby UK financial firms, including banks, insurers, and asset managers generally have the right to sell financial services and establish branches anywhere in the EU without other countries being able to impose different or additional requirements. Outside the EU, UK firms would no longer enjoy that right. Any interest in liberalizing trade in services, in which Britain is especially competitive, would also diminish if the UK were to leave. Sovereignty – Outside of the EU, the UK would no longer be subject in jurisdiction, EU social and employment policies and theoretically, only firms exporting to the EU would need to comply with EU regulation. Furthermore, it would be able to negotiate its own trade deals. However, it will still be bound by other international agreements. In the scenario where it signs up for the Single Market, the UK will still be affected by a significant array of EU legislation with the important difference being that the UK would not be able to influence the relevant legislation. Withdraw Process -The Lisbon Treaty Article 50 both outlines how the withdrawal process will work and, implicitly, why that process is disadvantageous to the leaving country. Both UK Prime Minister David Cameron and leaders of the Brexit camp34 have publicly stated that if the UK votes to leave the EU, then Article 50 of the Lisbon Treaty will immediately be triggered. These statements are direct replies to the Brexit claim that if the UK votes ‘No’, it would be able to use that as a tool to renegotiate a better deal with the EU while keeping the option of staying inside the EU alive. 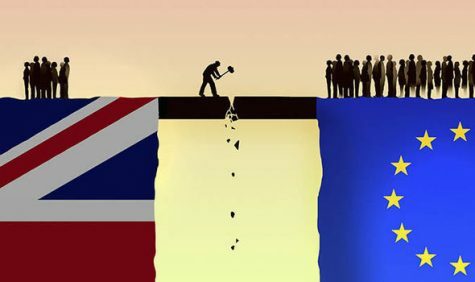 High-ranking EU officials have all stated that there is no ‘Plan B’ to the current EU-UK draft deal if the UK votes no, there will be no renegotiated agreement to stay in the EU. October 1: Michel Barnier began acting as the head of EU Commissions Brexit taskforce.